If a worldly person was to be told that one finds all the bounties of this world when true righteousness is instilled, he would certainly consider this as nonsense and will say that this is something that people say to gather masses around them in the name of religion. It is correct that some do say such things in the name of religion but they have ulterior motives for doing so and neither they nor their followers have any righteousness. Contrary to this Prophets of God and their communities have insight and perception of righteousness. They lead their lives involved in worldly affairs like earning a living etc. but are ever looking for righteousness and abide by it. Hundreds write to Hazrat Khalifatul Masih expressing the wish to have righteousness instilled in themselves and their children. This comes about after accepting the Promised Messiah (on whom be peace) and taking his bai’at. Awe of God makes them nonchalant about materialism but they are not deprived of worldly bounties. God bestows worldly bounties on His Prophets and true believers. At times they face temporary hardships but with His grace times change for the better. Righteous people have contentment of heart and they endure hardship positively and are grateful for whatever God gives them no matter little. This practice of gratefulness garners further grace of God and experiencing God’s grace believers are enthused to make sacrifices and indeed, they make them. In the current age Ahmadi Muslims have true insight into this subject. They have before them the time of the Holy Prophet (peace and blessings of Allah be on him) as well as the time of his true and ardent devotee, the Promised Messiah (on whom be peace). Explaining this, Hazrat Musleh Maud (may Allah be pleased with him) said God took everything away from the Holy Prophet (peace and blessings of Allah be on him) and from his Companions but they did not care about this for the sake of God and eventually God bestowed upon them. The Promised Messiah (on whom be peace) also left everything for the sake of God. He equally shared his father’s inheritance with his brother but his sister-in-law who later accepted Ahmadiyyat, used to consider him a freeloader. He endured hardship but later God greatly bestowed upon him. In one of his poetic couplets the Promised Messiah (on whom be peace) said that there was a time he lived on the leftovers of others but now God has enabled him so that thousands eat off his food spread. Reflecting on the early circumstances of the Promised Messiah (on whom be peace) and what followed is faith-enhancing for Ahmadis. Hazrat Musleh Maud (may Allah be pleased with him) said that his parents may have rejoiced at the birth of the Promised Messiah (on whom be peace) but when he developed an aloofness to worldly matters later, his father used to feel great despondence. As mentioned before, a Sikh related that the Promised Messiah’s father asked him to advice his son. The Sikh went to give advice and said to the Promised Messiah that his father was saddened that his younger son will have to live on the handouts of his older brother. It was his wish that his younger son entered employment during his lifetime because he felt that after his death all his resources will shut down. The Promised Messiah’s father had arranged for an employment for him as an education officer in Kapurthala and a job offer had been extended. When the Sikh put all this to the Promised Messiah (on whom be peace) he replied that his father was saddened and concerned for his future for no reason, adding, he had already taken up employment of Whom he was going to be employed with. This was the beginning of the life and times of the Promised Messiah (on whom be peace), the transient culmination of which at the time of his passing away was that thousands were ready to sacrifice themselves for him. His beginning was indeed small-scale but the high point he reached was such that apart from many who served him, over two hundred people ate at his Langar (public kitchen) every day. He was equal beneficiary with his brother of his father’s estate but the tradition in farming circles, and certainly at that time, was that anyone who did not take active role did not get a share. In early days if the Promised Messiah (on whom be peace) had a guest and he asked his sister-in-law for some food for him her negative and taunting remarks meant that the Promised Messiah offered the guest his own share of food and would either go without food himself or ate some [dry-roasted] chick peas. This is the same sister-in-law who later became an Ahmadi at the hand of Hazrat Musleh Maud. Divine missions start on small scale but amaze the world when they reach culmination. Today Langar does not just operate in Qadian but in the entire world; today these Langars have roti-plants installed. Hundreds of thousands of rotis are cooked in Qadian, Rabwah and London. As mentioned before when journalists came to UK Jalsa, with the grace of Allah which has extensive organisation, they were very impressed with the rotis. One of them expressed the wish to taste some and wanted more. The Ahmadi hosting the journalist told them that they could have as much as they liked, it was the Langar of the Promised Messiah where there was no shortage. Indeed, there was a time when the Promised Messiah had to give his own food portion to his guest and starve himself and today thousands eat from his Langar. This is of course not the ultimate high-point culmination. The Langar is going to spread further and millions will eat from it as indeed millions will enhance in righteousness after accepting the Promised Messiah (on whom be peace). The current level of sacrifice of Ahmadis is also going to grow to a huge degree. The comparison between now and then is one of the signs of the truthfulness of the Promised Messiah and a means to increase our faith. Spirit of sacrifice was generated in order to run all aspects of the mission and this was made possible through abiding by righteousness which in turn came to pass by connecting to the Promised Messiah (on whom be peace). Explaining the way the Promised Messiah (on whom be peace) ate, Hazrat Musleh Maud writes: ‘The way the Promised Messiah (on whom be peace) partook of food was amazing. I have never seen anyone else eat in that manner. First he would break off a small piece of phulka (small, light-weight unleavened bread) and then before making a morsel, he would break it further into slivers with his fingers while uttering SubhanAllah SubhanAllah (Glory to Allah). He would then take one of the small slivers and brush it with salun (curry) and eat. This was such a rooted practice of his that onlookers would be astonished. Some people thought that perhaps he looked for halal (permissible) slivers of bread to eat. However, the reason for this was the feeling that here we are eating food while God’s religion is suffering from problems. Each morsel would get stuck in his throat and it was as if by uttering SubhanAllah, SubhanAllah, he offered apology to Allah the Exalted that He had made food a necessity otherwise it was something not at all warrantable for us during times when faith was going through problems. Eating food appeared to be a striving; a struggle between profound, exquisite sentiments that arose in support of Islam and faith and between the demands that God Almighty has put in place owing to laws of nature.’ That is, the Promised Messiah (on whom be peace) ate food only out of necessity. This blessed model of the Promised Messiah (on whom be peace) draws our attention that when we use God bounties we should express gratitude and we should glorify Him as well as feel the pain for faith and religion and make efforts to try and be part of propagating religion. The manner in which the Promised Messiah (on whom be peace) partook of his food further explains the subject of glorification of God as Hazrat Musleh Maud (may Allah be pleased with him) derived a fine point from the Quranic statement: ‘Whatever is in the heavens and whatever is in the earth glorifies Allah…’ (62:2). He said that the Promised Messiah hardly ate one phulka and when he finished eating a lot of breadcrumbs were left behind. As he broke his phulka in small bits and ate some pieces and left others on his food spread. It is not known why he did this, though many people said he looked for pieces which would glorify God. Hazrat Musleh Maud did not recall the Promised Messiah ever saying this but this is what friends who were around maintained. Hazrat Musleh Maud (may Allah be pleased with him) said that God states: ‘Whatever is in the heavens and whatever is in the earth glorifies Allah…’ that is, heaven and earth are resounding with glorification of God. Why did God state this when we cannot hear the sound of this glorification? It is not written anywhere that such and such is sitting in Paradise for the past thousands of years because there was no benefit in telling us this! Therefore when God states: ‘Whatever is in the heavens and whatever is in the earth glorifies Allah…’ it can only mean that O people! Listen to this glorification. When people say for example that the moon has risen, they mean to say take a look at the moon or when it is said such and such person is singing, it is meant let’s go and listen to his singing. Therefore, when God states: ‘Whatever is in the heavens and whatever is in the earth glorifies Allah…’ it is meant hearken to the glorification and this in turn tells us that indeed we can hear it! There is of course hearing of a lower degree and hearing of a higher degree. This is why true believers are told to say Bismillah before eating and Alhamdolillah after finishing eating and glorify God accordingly when experiencing something good. Thus, glorification of God by a true believer is in essence verification of glorification of those objects/things about which he is offering glorification! However, how many are there who put this in practice? They eat and drink day and night and observe wonders of nature but does it have any impact on their hearts? Does it inspire them to glorify God? If not, then they have not heard the glorification! One could say there is no such sound but there are some sounds which cannot be heard with ears but are heard internally. Hazrat Khalifatul Masih explained that these sounds are then expressed in words. This manner of glorification of God should be adopted, in fact righteousness is in making it routine. Once a Christian came to see the Promised Messiah (on whom be peace) and said: you say the language of the Qur’an is mother of all languages although Max Muller and others have written that mother of all languages has brevity and is gradually extended by people. The Promised Messiah (on whom be peace) replied: We do not accept this formula of Max Muller. However, we will accept it for argument’s sake and see if Arabic comes up to mark or not. The person had also maintained the superiority of English over Arabic. The Promised Messiah did not know English, he asked the person to tell him how to say ‘my water’ in English. The man replied ‘my water.’ The Promised Messiah (on whom be peace) remarked: In Arabic only ‘ma’i’ will do when saying ‘my water’. Do say if there is brevity in ‘my water’ or in ‘ma’i’! Although he did not know English God caused the Promised Messiah to say these words which confused and embarrassed the man and he acknowledged that Arabic had more brevity. Similarly, God promised the Holy Prophet (peace and blessings of Allah be on him) that He will always protect him from the attack of enemies and will always create people who will understand and ardently love the Holy Qur’an and will elucidate and explain it and answer and silence the critics. Indeed, all the answers are within the Holy Qur’an. The Promised Messiah (on whom be peace) contended with the enemies for such a long period of time that at his passing away the adversaries acknowledged that no other Muslim scholar had defended Islam as magnificently as he did. It was a manifestation of: ‘…And Allah will protect thee from men…’ (5:68). It was God’s promise to the Holy Prophet (peace and blessings of Allah be on him) that he will be saved in any case. When the enemy attacked with the sword his sword was blunted, when the attack was done with reference to history, God raised Muslims who refuted all allegations by referring to history books and quoted books of the elders of the objectors to prove that whatever objections they raised against Islam also applied to their faith. As for matters relating to the Holy Qur’an and Ahadith, the Promised Messiah (on whom be peace) comprehensively dealt with those. Today it is the knowledge elucidated by the Promised Messiah which enables us to silence the objectors. Commenting on lack of knowledge and errant thought-processes Hazrat Musleh Maud (may Allah be pleased with him) related about someone who later became an Ahmadi but at the time of the Promised Messiah when he said that Arabic was the mother of all languages, this person took on the project to further look into although his scholarly credentials were rather lacking. The Promised Messiah (on whom be peace) was familiar with lexicon, he was familiar with the language and reached all conclusions based on knowledge. When the Promised Messiah (on whom be peace) said that all knowledge is in the Holy Qur’an he did not mean, for example, that it also states the principles of farming. He meant it has all the requisites of faith. The person pursuing the project however said that the Qur’an has everything in it. Someone put it to him that the Qur’an does not mention potatoes and chillies. The person could not contain himself and responded that the Quranic mention of: ‘…pearls and coral.’ (55:23) referred to potatoes and chillies. Hazrat Musleh Maud said on the one hand some people maintained that like Word of God, word of jurists was also immutable and on the other hand some people bring about changes and create chaos. Man should be ready to accept change but change is in the hands of God and He brings it about when He so pleases and none can stop Him. Hazrat Khalifatul Masih related that in the 1974 disturbances in Pakistan a maulawi was explaining the Quranic verse: ‘Say, ‘He is Allah, the One;’ (112:2) and his elucidation was that it meant Ahmadis were kafir! A man came to Qadian during the time of the Promised Messiah (on whom be peace) and said that if Mirza Sahiba was known as Ibrahim, Nuh, Esa and Musa, he too was called Muhammad by God Himself. He said he heard God’s voice telling him this. People tried to make him understand but to no avail. They decided to take him to the Promised Messiah (on whom be peace). He repeated his claim when presented to the Promised Messiah and said God told him so all the time. The Promised Messiah (on whom be peace) said God did not tell him he was Ibrahim, Esa or Musa all the time, but when God called him Esa, He gave him qualities of Esa and when God called him Musa God granted him signs like those of Musa. He asked if God called the person Muhammad all the time, did God also grant him verities and knowledge of the Qur’an? The man replied, no, he did not have any of that. This is the difference between the truthful and the liar. If a person hosts someone he will offer him food but one who only bluffs will invite someone over and place empty dishes before him and say it was fine food. God does not bluff, Satan bluffs. The man was told that if he was called Muhammad but was not given any knowledge of the Qur’an then he was called Muhammad by Satan. When God grants something He grants additional things in accordance with it and if that man was not given anything additional then had to be assured that he was being called Muhammad by Satan and not God. Truth is that only God brings about and grants change. Some people misunderstand matters after experiencing a few true dreams and make big claims. They are in fact under the influence of Satan. When God grants something to someone He also grants brilliance and luminosity and signs can be observed with God’s practical testimony corroborating on behalf of the person as we saw with the Promised Messiah (on whom be peace). We also see this with Khilafat e Ahmadiyya. Funeral Prayer in absentia of Sahibzadi Amatul Bari Begum Sahiba was announced who passed away on the night between 31 August and 1 September at the age of 87. She was a granddaughter of the Promised Messiah (on whom be peace), daughter of Hazrat Mirza Sharif Ahmad Sahib, maternal granddaughter of Hazrat Muhammad Ali Khan and daughter in law of Sayeda Amatul Hafiz Begum Sahiba and Nawab Abdullah Khan. She was a paternal aunt of Hazrat Khalifatul Masih. She was born in Qadian in 1928. Her nikah took place in 1944 and Hazrat Khalifatul Masih II (may Allah be pleased with him) spoke at length before the nikah. He said that over half a century before the Promised Messiah (on whom be peace) published one of his revelations with the words: ‘…and you will live long enough to witness your distant progeny.’ (Tadhkirah, p. 9). He went on to say: We have been seeing the fulfilment of this revelation. At times a revelation loses its glory with time and at times the glory and greatness of a revelation is enhanced with the passage of time. At the time this revelation was received the Promised Messiah (on whom be peace) had only two sons. Later, he had more children and God extended his family and now his progeny is getting married. Indeed, objections could be raised that people have large progenies, what is so unique in that! But the question is how many of these families are associated with their forefathers and feel pride in it! This revelation tells us that the Promised Messiah’s progeny will continue to be associated with him and people will say that it is a sign of his truthfulness. The revelation does not simply mean that he will have a large family but also signifies that the Promised Messiah’s (on whom be peace) greatness and glory is so high that his family would not even want for a minute not to be associated with him and their kudos will increase with this very association. No matter how high a position the family may attain, even if it is granted sovereignty, it will feel honour in being associated with the Promised Messiah (on whom be peace). The revelation means that God told the Promised Messiah that his family would never lose sight of him. In explanation of this revelation the Promised Messiah (on whom be peace) said: ‘One day or sorrow and four of happiness’. This signifies that no doubt people [in his family] will die but where one will die, four will be born. The family of the Promised Messiah (on whom be peace) will remain a sign of his greatness and will feel pride in affirming his prominence and the world will also acknowledge this. Hazrat Khalifatul Masih said he has mentioned this discourse in with detail because a huge responsibility lies on the family of the Promised Messiah, which they should appreciate and remember the statement of the Promised Messiah: having being associated with us, do not bring us in disrepute. He said there is no greatness in merely being his family, it is everyone’s duty to abide by his teachings and uphold his great status. Sahibzadi Amatul Bari Begum Sahiba had the honour to travel to Pakistan from India at the partition in the same vehicle as Hazrat Amaan Jan. Once in Pakistan she lived at Rattan Bagh, Lahore and then stayed on in Lahore. She was a great sponsor of the needy and was most hospitable. Often her home would be full of guests including family, others, the underprivileged etc. Her hospitality was most excellent. Her social circle was huge and she kept good terms with non-Ahmadi relatives from Malerkotla. She would have students studying in Lahore both of family and others as permanent guests. She would be ever ready to host whoever called on. She knew many historical accounts of the life of Hazrat Musleh Maud which she narrated to family and these have been saved. God made her prosperous and she always spent on the needy. She paid for the education of many children and also helped with their marriage expenses. After the death of her husband she initiated a scholarship in his name. She had fallen over and had had a few operations and was in great pain but she endured it all steadfastly. She passed away following a heart attack. She was most excellent in paying her chanda contributions and served Lajna in various capacities from 1958 to 1994. Hazrat Khalifatul Masih said he has not seen anyone involve family as well as others on a basis of familiarity in times of joy and sadness as she did. 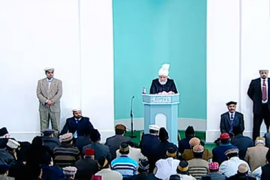 Hazrat Khalifatul Masih said this year he had worn a different coat at the time of International Bai’at. This coat belonged to the Promised Messiah and was passed on to Hazrat Mirza Sharif Ahmad Sahib and later to Sahibzadi Amatul Bari Sahiba who had sent the coat to Hazoor. She had an intense connection with Khilafat and used to keep in touch via telephone. She had expressed her concern for her children to be enabled to practice piety and live in harmony. May Allah make it so! May He elevate her station and grant her forgiveness.